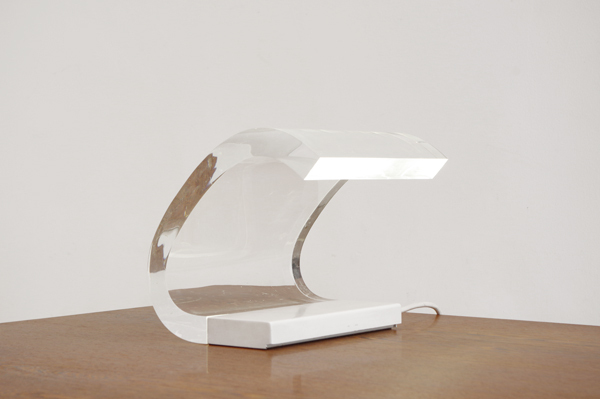 Table lamp “Acrilica”, a modern transparent acrylic lucite table lamp - clear, by Gianni Colombo and Joe Colombo, 1962 for OLUCE, Italy. 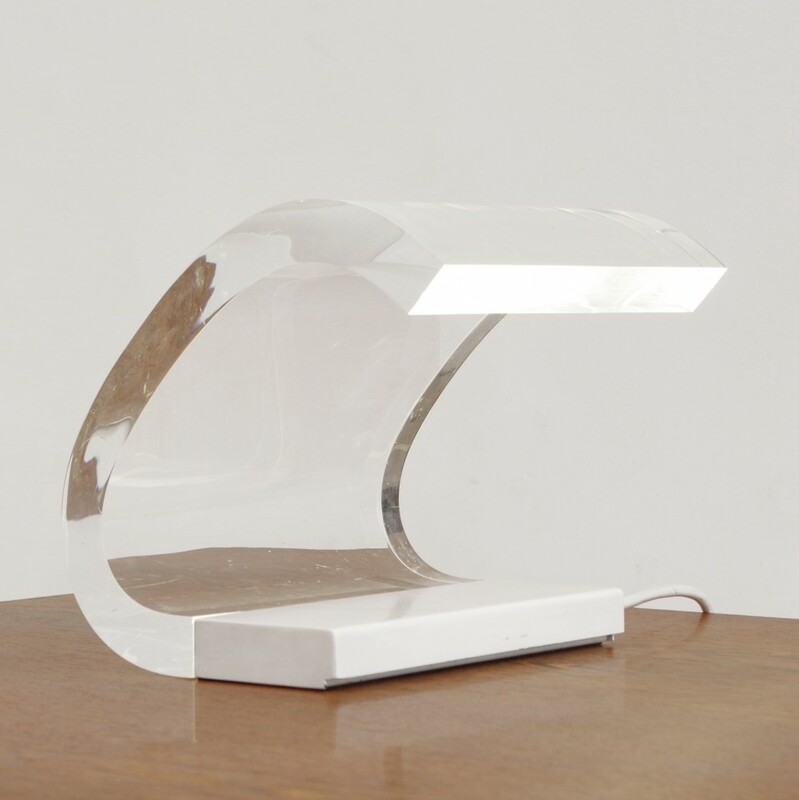 New edition available; “Acrilica” Modern Clear/Acrylic Shade Table Lamp by Oluce with black metal base. 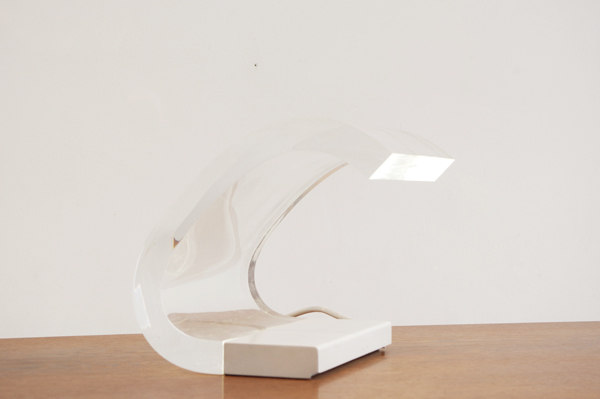 Bring the clean-cit modern gallery look to your house by adding this sleek table lamp to your living room or den. Its sculptural transparent shade features organic curves in a clear acrylic finish to create a sophisticated contemporary appearance, and the base is chic black for a touch of designer-style minimalism. In 1962 Joe Colombo collaborated with his brother Gianni on developing Acrilica. Acrilica was inspired by the lighting associated with a hotel project in Sardinia where a counter-ceiling was used to realize a particular mode of indirect lighting. The Acrilica table lamp was awarded the Medaglia d’Oro (gold medal) at the XIII Triennale, where Joe Colombo also won two silver medals for the Combi-Center and the Mini-Kitchen, shown below. Acrilica established Joe Colombo as one of the great designers of the day. He is well represented at the Museum of Modern Art in New York and other museums worldwide. Joe Colombo won the Compasso d’Oro (the first for Oluce) in 1967 for the Spider group and in 1970 for the Candyzionatore air conditioner. Spider is a single lighting fixture designed to be a horizontal spot light. In a variety of geometries the lamp is suitable to be employed in different situations (home or office) and on different supports (table, floor, wall, or ceiling), its geometric versatility resulted in the novel concept of a “family” of lamps. Acrilica was first included in the 1962 Oluce catalog. 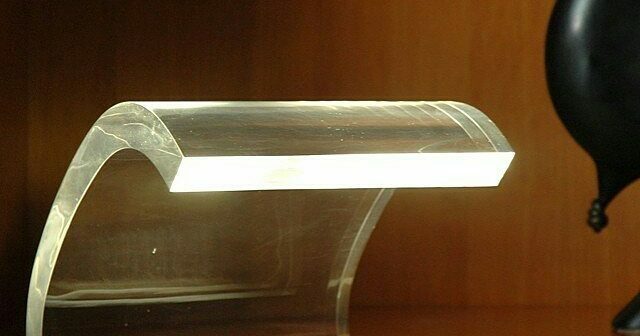 The lamp realizes indirect lighting through internal reflection of light through a curved piece of transparent PMMA (acrylic). Through this curve, light appears to climb. 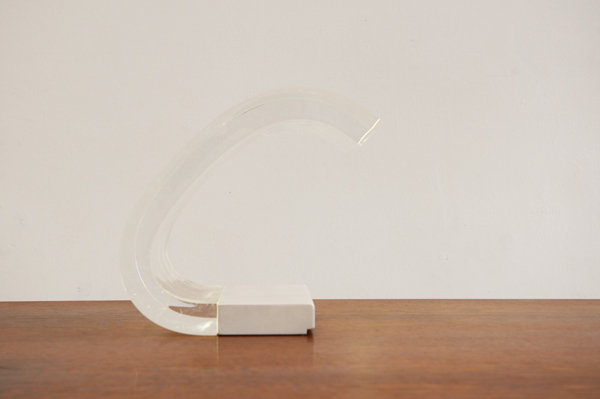 The innovative Acrilica lamp consists of an elongated foot with the source of light, to which a transparent, C-shaped sheet of acrylic resin, bent upward, is attached to conduct the light from the foot. 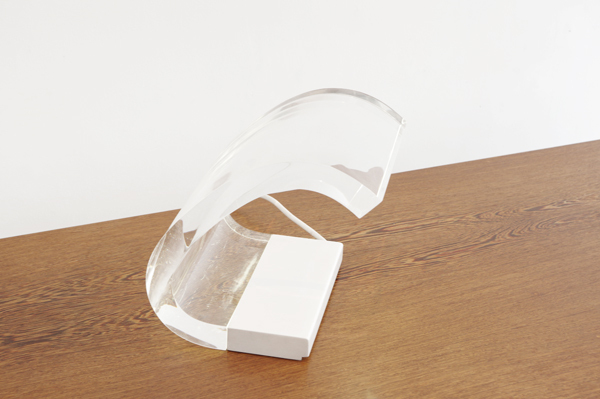 In the Acrilica table lamp, Joe Colombo masterfully used both the thermoplastic and optical properties of acrylic resin to create a beautiful lamp that relies on a “light piping” effect similar to what could be expected in a fiber optic arrangement. The base of the lamp is in black metal and the entire lamp is 9 1/4 by 9 1/2 by 9” (23.5 by 24.1 by 22.9 cm) in size.